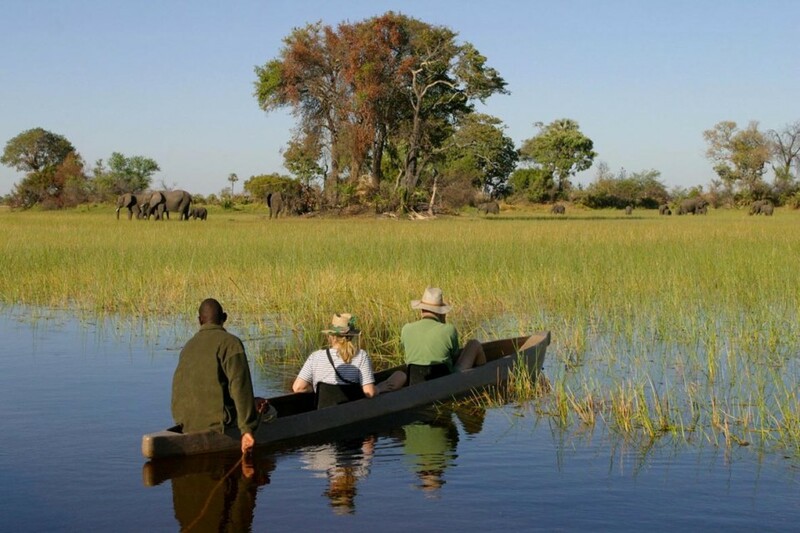 On this 9-day exclusive fly-in safari you will fly into the world-famous and largest inland delta in Africa, the Okavango Delta. On mokoro trips as well as bush walks and boat trips you will explore this unique ecosystem. The journey then takes you to the edge of the well-known Moremi Game Reserve, which is famous for its excellent game viewing. 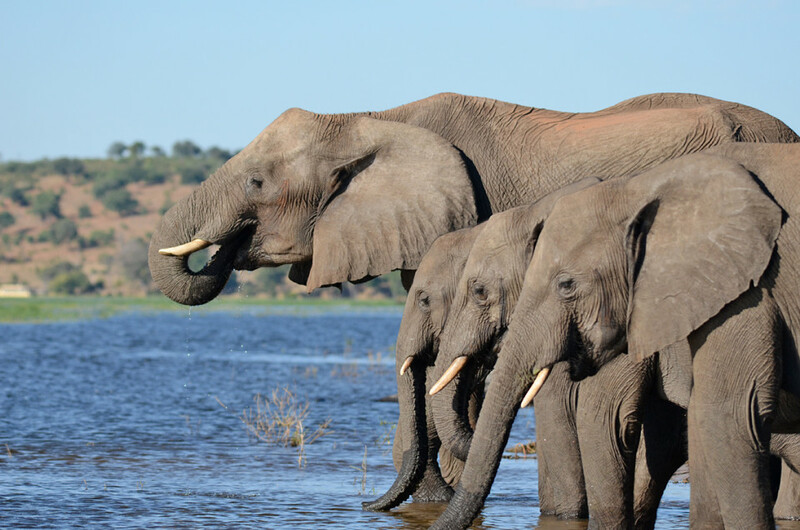 You then take a flight to Kasane, the gateway to the Chobe National Park, home to thousands of elephants. Last but not least you are transferred to Victoria Falls where you will visit the “Mosi oa Tunya” – the smoke that thunders. 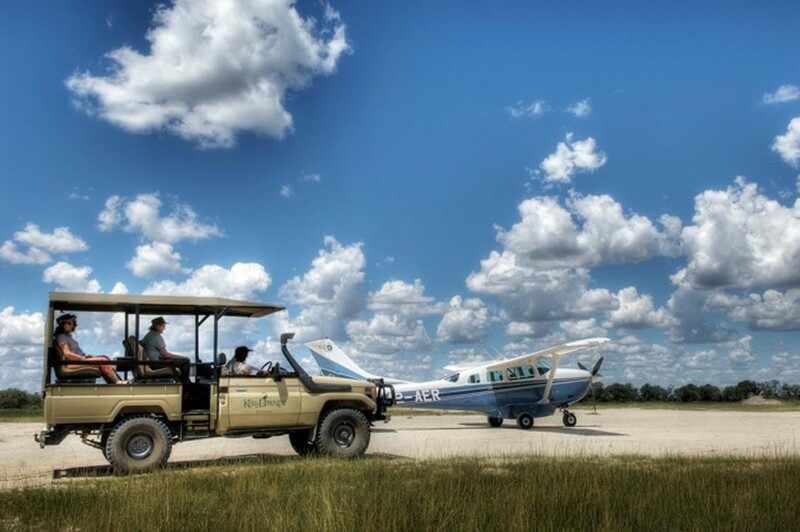 The safari starts off with a light-aircraft transfer that takes you from Maun across the Okavango Delta to Gunns Camp. During the flight you can enjoy the breath-taking view over the largest inland delta in Africa, which is home to a lot of wildlife. Gunn’s Camp is situated on Chiefs Island, an island bordering the Moremi Game Reserve. Different species of antelopes, elephants, wild dogs and lions call this area their home. Furthermore the Okavango Delta is a paradise for birdwatchers. During your time in the delta, you go on mokoro trips as well as on bush walks. 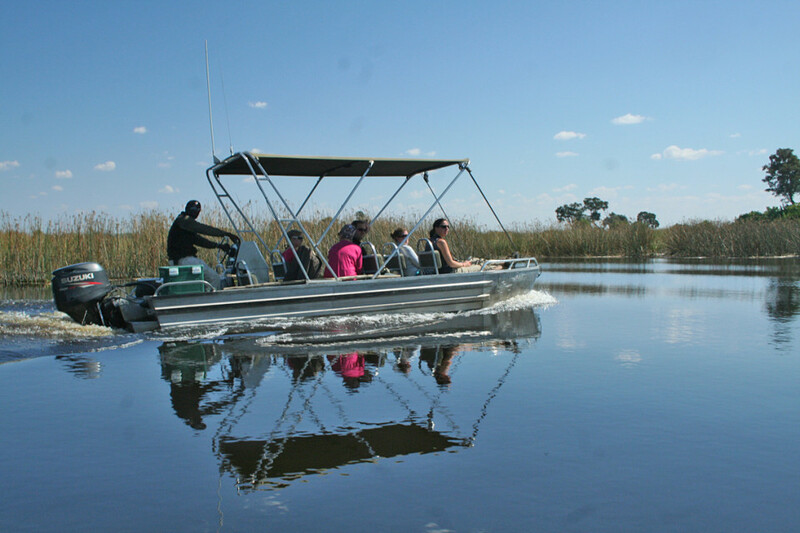 In the afternoon you have the possibility of joining a motorboat trip on the lagoon where enjoy a typical African sunset over the unique Okavango Delta. You will spend two nights in one of the classic safari-style meru tents at Gunns Camp. After a morning game drive (if time allows) and breakfast, you are flown out of the delta to Khway, where you will spend the next two nights at the Sango Safari Camp. The Sango Safari Camp also borders the Moremi Game Reserve and it is situated in a private concession directly on the Khway River bed, known for excellent game viewing in the Moremi Game Reserve. 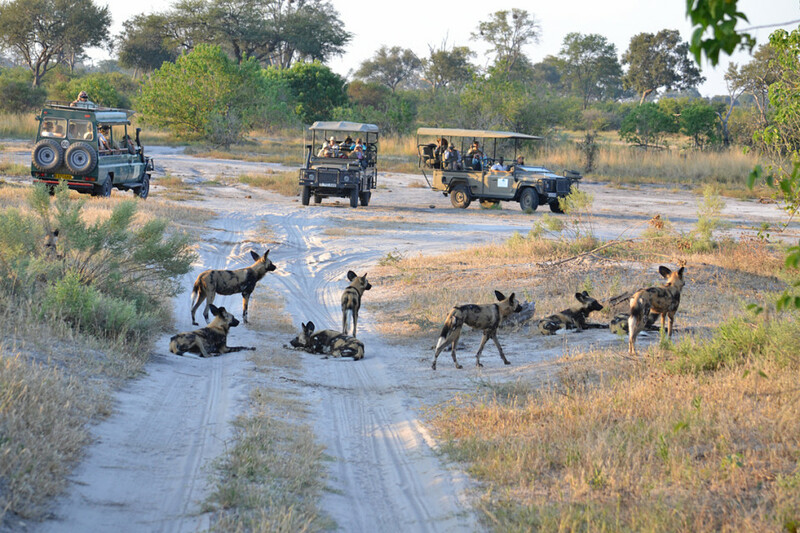 Your guide will take you on game drives in the Moremi Game Reserve as well as on game walks and night drives in the Kwhai Consession. The region around the Sango Safari Camp is world famous for great game viewing. 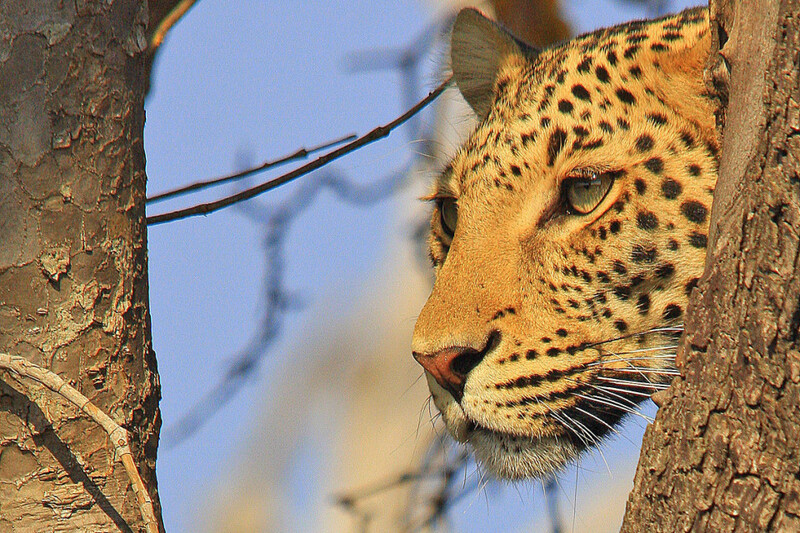 Animals that can be spotted here include elephants, buffaloes, zebras, lions, leopards, cheetahs, wild dogs, giraffes, antelopes, hippos, hyenas and a range of nocturnal animals. After a leisurely breakfast you are picked up at the Kubu Lodge and taken across the border to Zimbabwe. There you will spend two nights at the Ilala Lodge close to the Victoria Falls. You will visit the Victoria Falls, also known as “Mosi oa Tunya”, which literally translated means the smoke that thunders. There are a number of activities available here and you are spoilt for choice. You can stroll along the falls, do a sunset boat cruise on the Zambezi or fly over the falls in a microlight plane. The more adventurous among you can go white water rafting or bungee jumping from the highest bridge in Africa. After breakfast your fly-in safari comes to an end and you are transferred to Victoria Falls Airport for your flight via Johannesburg or Windhoek back to Europe, where you will arrive the next morning with a lot of new impressions and experiences. - As a fly-in safari is booked on an individual basis you won’t travel in a group. You will however meet other travellers at the accommodations you are staying at and some might even travel the same route as you. In general fly-in safaris are booked by people from all over the world. - The journey Maun-Okavango Delta-Moremi Game Reserve-Kasane is done with a light aircraft, carrying a maximum of 6 or 13 people. - The transfer from Kasane to Victoria Falls is usually done in a minibus. - Breakfast generally consists of a full English breakfast as well as of cereals, toast, cheese, jam, fruits, juices, tea and coffee. Light meals like salads, sandwiches or pasta dishesare served for lunch. For dinner it is usually a three course menu or a buffet with different meat, poultry, fish, rice, pasta or vegetable dishes. - We recommend that you take along some extra cash for drinks, snacks and souvenirs. 10-15 USD per day is usually sufficient (depending on your spending habits). In addition you should allow some extra money for tips and optional activities in Victoria Falls. - In general European citizens do not require a visa for Botswana. For Zimbabwe a visa is usually required. 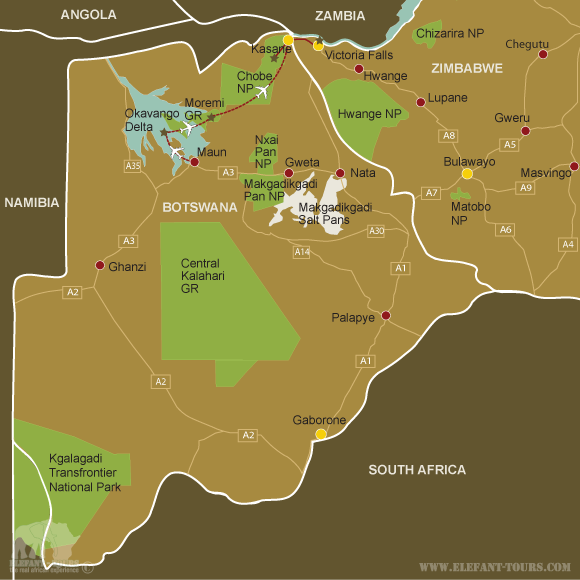 - As Botswana and Victoria Falls are situated within a malaria area, we would recommend some precautions. Please speak to your doctor or travel clinic about the different prophylaxis and their effects and side effects. - Luggage, including camera equipment and hand luggage is restricted to 20kg per person travelling.